DECA Laurier once again has something to celebrate. At the DECA U Provincials Jan. 20-22 in Toronto, the 107-student delegate team won 37 medals and awards in areas such as Management Consulting, Marketing Management, Business Financial Services, and Business 2 Business, claiming the Highest Awarded Chapter title for the second consecutive year. Eight competitive teams placed top three overall in their respective category, gathered using a combined average score from their written exam and oral presentation. Second-year BBA students Liliana Campione and Kendal Rudka, and second-year Communications student Adam Rezkalla, were awarded first place in the Advertising Campaign Challenge, defeating 21 other teams. Nandani Seth, a fourth-year BBA student, was named the first ever Delegate of the Year, from a total delegation of over 1,300 students. Consisting of over 300 students ranging from first to fourth year, the DECA Laurier chapter aims to foster a platform of opportunity for the business leaders of tomorrow by immersing them into an engaging and competitive network of ambitious and passionate students. 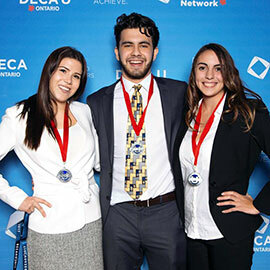 DECA Laurier inspires success through a unique format of conferences and competitions held in-house, and at the provincial and international levels. DECA Laurier has hosted two on-campus conferences, The Apprentice in November and Charged Up in January, to prepare students for the big weekend. Students who placed first in their categories at these in-house events were awarded a trip down to the IBM Headquarters to meet with executives over lunch and be considered for their award-winning Summit Internship Program. “Being the co-president this year made me realize the incredible dedication, hard-work and enthusiasm of our students that lead to DECA Laurier’s continued success year after year,” said Price. “As much as Thomas and I would love to take credit for our chapter’s success–and occasionally we do–we truthfully owe it to our wonderful executive team and all-star delegation for bringing it home, one more year,” said Kukreja, a long-time member of the DECA organization. DECA U is Canada's largest undergraduate business case organization. This year’s competition was the largest provincial competition in DECA U’s history, with 22 universities and over 1,300 student competitors. It also marked the first competitive year where universities outside of Ontario, including UBC and Dalhousie, sent their chapters to compete. All of the Lazaridis School’s individual and team medal recipients have qualified to compete at the 2017 DECA Internationals Conference in Anaheim, California this coming April. DECA Laurier’s final conference on Mar. 4 is open to all 300-plus members of the DECA Laurier chapter; the 21 surrounding universities will also be invited to compete at this year’s flagship event.